It's been quite a while since I've shared an intake post with you guys and I'd like to change that starting today! There's really no point in sharing other than for fun. I love to watch others Youtube videos or read posts about what they're eating each day. It inspires me to try new or different things than I'm normally used to eating. Today was jam packed with a 6 a.m. gym session followed by running home to fit in some yoga, breakfast, a shower, and then I headed off to work from 10-5. After that I came home for a quick dinner and was off again to watch my sisters powderpuff football game until late this evening. So this is a day of quick and healthy foods that I eat when I'm in a time crunch but still want something filling and nutritious. Definitely no pretty pictures of banana ice cream or fancy dinners with proper lighting. This is real life, daily food! Before we get started I just wanted to say that this is a typical day of food for me. I take into account the amount of activity I will be doing and eat according to whenever I am hungry, stopping when I'm full. My intake is primarily high carb, low fat naturally because that is what I crave and what I feel my best consuming. I want this to be a simple, fun post. Never feel like you eat too much or too little based on what someone else is consuming. Every body has different needs each day. Eat according to how you feel and what you like (as long as it's vegan) and simply use this as a fun inspirational post. I go to the gym every morning at 6 a.m. so I'm up around 5. I drink a liter of lemon water and then make a banana smoothie for the ride. I always use 3 bananas, coconut water, and ice. This gives me enough fuel to complete my workout but not too much that I'd feel sick! I come home from the gym and do anywhere between 30-60 minutes of yoga depending on the day. After that it's time for my second breakfast which is usually a green smoothie. But my spinach was looking and smelling quite questionable this morning so I decided to pass on that. 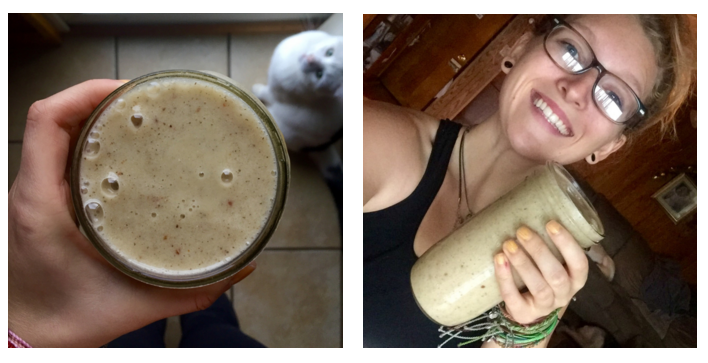 I had a 5 banana, maca, date, and chia seed smoothie instead. So delicious!! *makes mental note to have to eat greens later in the day at some point* I grab a quick shower and I'm out the door for work. For lunch at work I had a huge bowl of leftover spicy curry that I made. 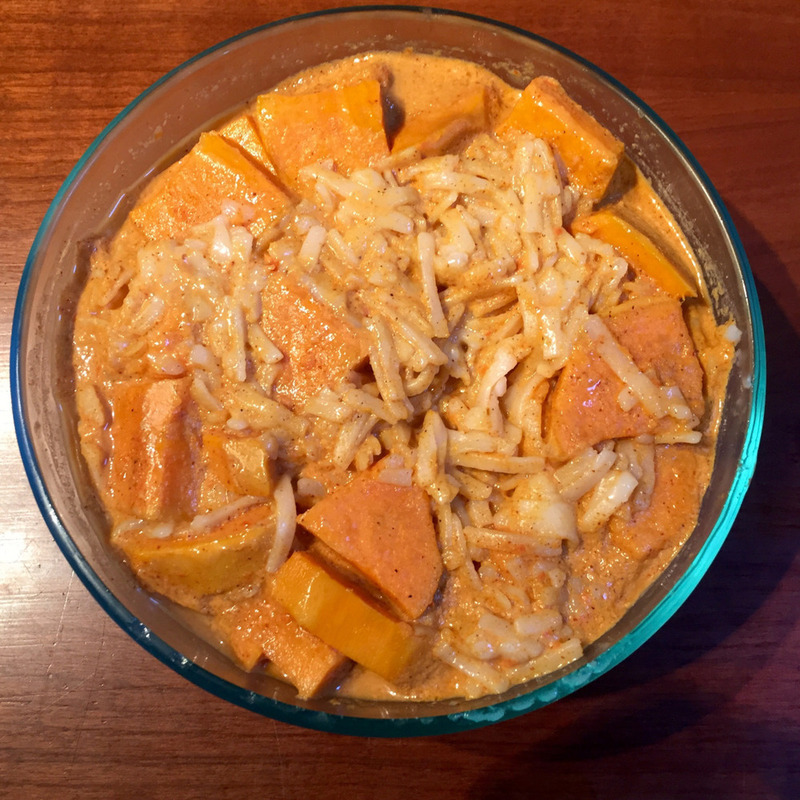 It's just a curry sauce with rice noodles, sweet potatoes, and chickpeas. This kept me so satisfied throughout the whole afternoon. I was surprised because usually I snack more throughout the day but I was still feeling good from lunch right up until dinner time! 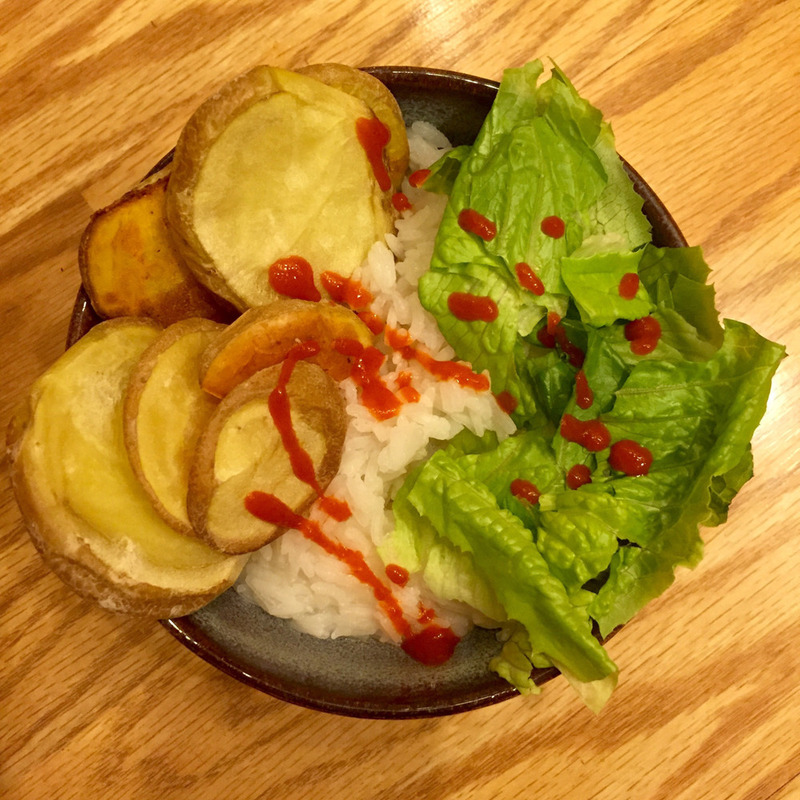 I was pressed for time with dinner so I cooked some rice, potatoes (more not pictured) and some romaine! Oh and I topped it with sriracha that I actually dumped all over the floor and the dog right before taking this picture. Whoops! I love simple dinners like this. They keep me full throughout the evening and are nice and comforting (also so easy) to make! That's it for today! I enjoy making posts like this so I might try to do it a bit more often. It's fun and an easy way to share with you guys a bit more into my life behind the scenes of my recipe posts. Most things I make look nothing like that and I think that today's food was a good example of just that! Thanks for joining me!